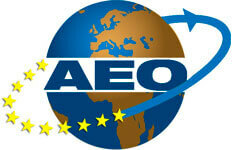 ...extends service life of rotating unions! Rotating unions are used to convey various media into and through rotating machine parts. 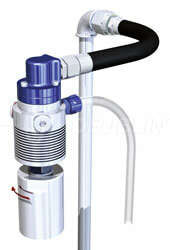 Media such as water, hydraulic or thermal oil, compressed air, vacuum, coolants etc. can be conveyed. In case of current rotating unions, sealing between the rotating element, “rotor”, and the stationary part, “stator”, is almost always realised by mechanical seals with the respective technical finesses. Despite extremely precise production and use of highly resistant materials, each rotating union is subject to wear which is inevitable due to its function. Irrespective of the technical parameters limiting the service life of a rotating union, such as speed, pressure, temperature, flow, volumes and flow velocity of the media, further factors influence the service life considerably. Accordingly, the mounting process is also a main factor for the service life of a rotating union. Due to their bearing, it is important that it can easily be rotated in mounted condition without any warping. Improper hose length or screwing parts may cause warping of the bearings already at this stage. 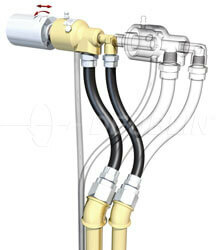 In particular the installation of the hoses is very important. 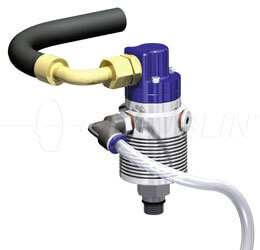 The main aspect: First the flexible hoses are to be attached to the rotating union and then it is connected to the shaft end by screwing at the prescribed torque. When connecting the flexible hose to the solid pipe, avoid twisting of the hose. - Never connect the rotating union to a solid pipe. These hoses are to be laid as a bow and without torsion and to be connected to the stationary pipe in a pressure-tight way. A rotating union is to be connected to the machine part also in a pressure-tight manner while the torques prescribed by the manufacturer must not be exceeded. It is further important that the retainer for the rotating union is free from burr or chips. If required, the drainage must always be laid downwards (at least 15°) and with a free cross-section which is as large as possible. In case of a rotating union installed vertically, the drainage must be guided downwards; in case of a rotating union mounted horizontally, the vent for controlled leakage must point down, metaphorically speaking in “6 o’clock position”. If the drainage is located higher than the vent, the rotating union would be flooded by the occurring leakage causing an improper operating mode. Normally, the above mentioned items as well as the observance of the mounting order should be a matter of course, but in practice, some users are obviously looking for “alternative assembly”, as can also be seen from the pictures. Instead of wondering about the “short” service life, the user should have “listened” to his rotating union immediately after the initial operation. It quickly reveals that the installation position is not correct. If it runs untrue or tumbles, the centring is not within the tolerance - a sign for wear of the screw thread or a mounting failure. 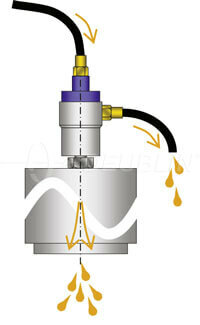 The rotating union causes noises by vibrations or is hot in the area of the bearing. This again indicates that there is warping caused by the installation and that the rotating union does not run freely. If these failures are eliminated immediately (or even not made), the user benefits from an extended service life based on the parameters of the application without any disturbance resulting from assembly. Then the precision part “rotating union” operates highly effective and helps to reduce machine downtimes and maintenance costs in most cases. In case of all rotating unions based on the technology of the “balanced mechanical seal”, even those with permanently closed mechanical seals, minimum quantities of the transported medium can be found between the seal faces. They are useful for lubrication and help to avoid damages by dry run. Despite their high technology, rotating unions are wear parts; accordingly a certain quantity of leakage can be used as indicator for the condition of the mechanical seal. As the law of gravitation also applies to rotating unions, drainages should always point downwards in order to carry away any leakage quantity properly. Actually this goes without saying, but installation positions with drainage partially or steadily pointing upwards have already been detected. This improper connection causes stagnant leakage quantities to flood the bearings or impurities in the medium can deposit inside the rotating union in case of downtime. Both factors reduce the service life of a rotating union considerably! In the machine tools and processing centres range, “mixed operation” is usual: Use of coolant, dry processing, compressed air during stoppage or rotation, minimum quantity lubrication. The rotating unions such as “POP-OFF”, “AutoSense” or “All-Media", which are suitable for these procedures, separate the seal faces, if no medium pressure is applied and or adjust the distance between the seal faces in conformity with the medium. 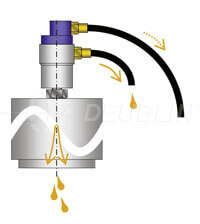 Of course, the tool change will take place in depressurized condition, and as the mechanical seals are separated at this moment, the coolant drains off the supply lines and spindle through the opened seal faces. This fact cannot be influenced, but the lost quantity of the expensive coolant: By guiding the supply lines downwards, as in case of the drainage. In addition to the prevention of coolant losses, filtration and maintenance of the coolants positively influence the service life of all components. 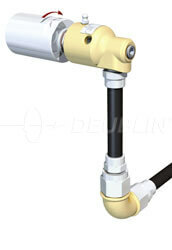 Rotating unions by well-known manufacturers such as DEUBLIN are designed in a way as to largely resist various impurities in coolants occurring in most of the production plants. In order to obtain a long service life and maximum productivity of the rotating union, the coolant is to be filtered according to ISO 4406:1999 Code 17/15/12, SAE 749 Class 5 or NAS 1638 class 8, maximum particle size 60 µ. Comparison: Pumps (fixed piston as well as variable volumes) normally require coolant filtration according to ISO 4406, Code 16/14/11 or better – in other words: They only tolerate half as much contamination. Only distilled water should be used for coolant preparation. Calcium and magnesium salts in tap water reduce the service life of coolants by displacing the chemicals in the coolant and breaking down the oil-water emulsion. Furthermore, they advance the growth of bacteria. These salts may also cause deposits inside the rotating unions resulting in premature failure. Rule of thumb: Each additional hardness degree (equivalent to 17 ppm or 17 mg/l calcium carbonate) increases the annual coolant consumption by 1 %. Suitable maintenance of the coolant further increases the service life of the tools and improves the surface quality of the work pieces. If, for reasons of efficiency and costs, there is a real “fight” for each half a second of machine time, each half a cent of part costs and each scrap part, the above tips are to be taken to heart, as they really help to save money!